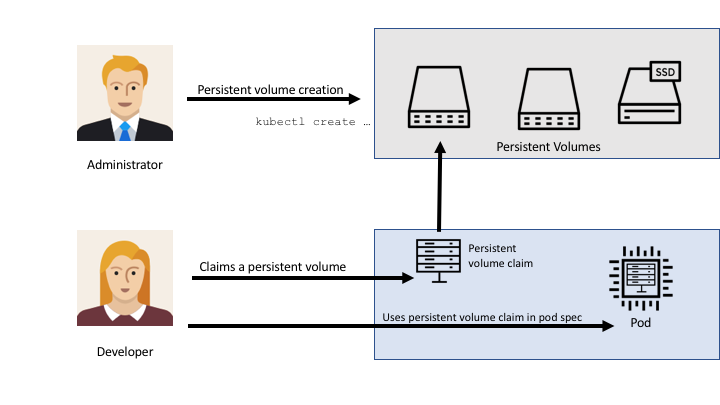 What is a kubernetes persistent volume? How do they differ from kubernetes volumes? Why would you use persistent volumes? How do I get started using persistent volumes? Kubernetes persistent volumes are administrator provisioned volumes. These are created with a particular filesystem, size, and identifying characteristics such as volume IDs and names. There are currently two types of storage abstracts available with Kubernetes: Volumes and Persistent Volumes. A Kubernetes volume exists only while the containing pod exists. Once the pod is deleted, the associated volume is also deleted. As a result, Kubernetes volumes are useful for storing temporary data that does not need to exist outside of the pod’s lifecycle. Kubernetes persistent volumes remain available outside of the pod lifecycle – this means that the volume will remain even after the pod is deleted. It is available to claim by another pod if required, and the data is retained. So how does the usage of Kubernetes volumes differ from Kubernetes persistent volumes? The answer is quite simple : Kubernetes persistent volumes are used in situations where the data needs to be retained regardless of the pod lifecycle. Kubernetes volumes are used for storing temporary data. Why do we use persistent volumes? In the earlier days of containerization there were some pretty strict rules / best practices put in place. First and foremost was that containers should be stateless. As Kubernetes has matured and container native storage solutions (such as Portworx) have been created, there is no real reason to draw the line at stateless applications. You may want to gain the benefits of having your application in a container (fast startup, high availability, self healing etc) but also store, retain and back up data created or used by that application. The most common use case for Persistent volumes in Kubernetes is for databases. Obviously a database needs to have access to its data at all times, and by leveraging PVs, we can start using databases like MySQL, Cassandra, CockroachDB and even MS SQL for our applications. By ensuring the consistent state of our data, we can start putting complex workloads into containers, and not just stateless, 12-factor style web applications. The claimed storage is mounted inside the pod as required. These high-level steps will be repeated for each pod in the application set, and happens in series. This way, we can be confident that the initial pod deploys and has required storage, and each additional replica that is created has identical storage attachments and mounts (required for any clustered application). We can easily scale this stateful set of pods and join many more replicas to the distributed application. If any of the pods fail, they can be replaced and have the storage reattached. Edit this file, and paste the below spec in. Change the storage capacity to your desired amount. The above example will create a 10 GiB volume. Replace <volume_id> with the desired ID of the volume. For example, this could be “pv0001”. The volume has now been created, and is ready for a Persistent Volume Claim to use this. You will see that 10GiB has been provisioned, spread across the 5 storage nodes in the example Kubernetes environment.